Spare Parts is a robot adventure with just enough mix of plat forming and fighting to make a casual gamer smile. 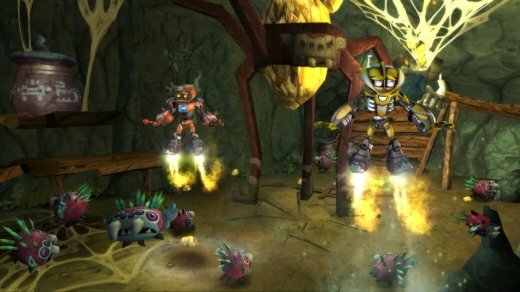 The player controls a robot, stranded on some odd planet. Finding a ship with a computer intelligence known as Con-Rad. 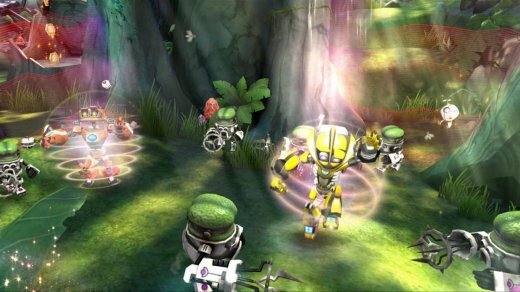 (Voiced by a strangely reserved Simon Pegg) Play two-player co-op, and you will be seeing both robots, Mar-T and Chip. It is here that our robotic hero finds out that there is a chance to get off this rock. All they have to do is find spare parts that are scattered all over the planet, fix the ship and waboom escape! Search and acquire is the name of the game with plat forming, puzzle solving and even some fighting thrown in for good measure. Getting past each level requires finding the ship parts scattered about, while some seem to be fairly straightforward and simple to find, other pieces require a bit more work on our robots part. Thankfully, there are robot upgrades to be had through out the game. Players may upgrade after a time by spending little coins dropped by vanquished enemies. Various skills can be obtained when upgrading, such as a hacking device, magnetic boots, upgrades to your robot arms in order to have the extra pushing power to move heavier objects. The upgrades aid in activating switches and of course defeating enemies. The fighting is easy for the most part with most of the aliens simple to defeat with a few well thought out moves from your robots fighting styles, from toe to toe punching, to jumping into ground pounding smashes. There are even some long-range attacks such as throwing little wrenches at a target. There are a few fights considered boss fights, those you really have to work harder and use the more diverse skills of your bucket of bolts. The visuals look good, with your robot character being down right adorable. I know this on the first hand squeal of our other staff writer/photographer Donna Millheim. “Oh he is so adorable.” She quoted. I had just upgraded some stronger arms on the robot. Uncannily the little graphic of the robot was doing its best strong man impressions….prompting me to wonder if the little lug nut Romeo heard my wife’s exclamation. Environments range from spacecraft interiors, jungles, desert canyons and strange underground caverns. All are bright and interesting. As noted, there is co-op ability to the game and it can be fun once the two of you master the sometimes-quirky controls. Small issues crop up when jumping towards or away from the camera view for instance. 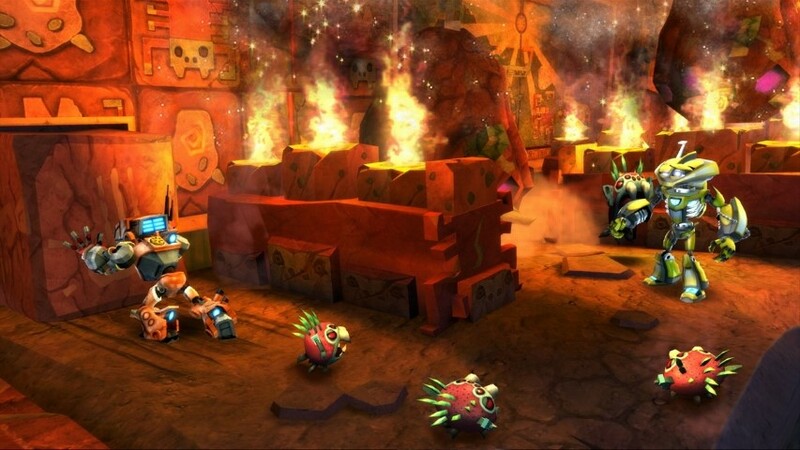 Overall, it is a family friendly game with lots of potential fun. Get past the some times repetitive play and you will actually have some fun. The single player experience seemed to have been more fun for me anyway. Slightly under whelming in some respects, the game could have done well with more whit and sharpness in dialog from the voice talent for instance. Blame the script, not the talent. It is a fast simple game. With visuals that will delight for a time.